Dark-eyed Juncos are also known as “snow birds” because of their tendency to flock to feeders ahead of a bout of snowy weather. I wrote my first “Feathered Friends” column on Sunday, Nov. 5, 1995. Over the years, the column has appeared in various newspapers. I’ve also been posting weekly blogs on the subject of birds since this past February. It’s with some irony that I can now reflect in just the few months since the paper that gave the column its start decided to rudely cut ties with both the column and me, other news outlets have stepped forward to carry my weekly thoughts on birds and birding. The column is currently published weekly in three different newspapers: the Bristol Herald Courier, the Erwin Record and The McDowell News in Marion, N.C. The column also runs weekly in the Carter County Compass, an online news source for the citizens of Elizabethton and Carter County. Sometimes, I wonder where the time has gone as I reflect on the fact that I am celebrating the 19th anniversary of my writing this weekly column, which has appeared in four different newspapers. These days, I also write a weekly online blog about birds while also making bird-related and nature-related posts to my Facebook page. I constantly wonder what I am going to write about each week. Fortunately, I seem to have enough interested readers that someone is usually calling or e-mailing me with an interesting observation or a question that helps get the ball rolling for another column. I always enjoy hearing from readers, and I hope to continue to do so in the coming years as well. 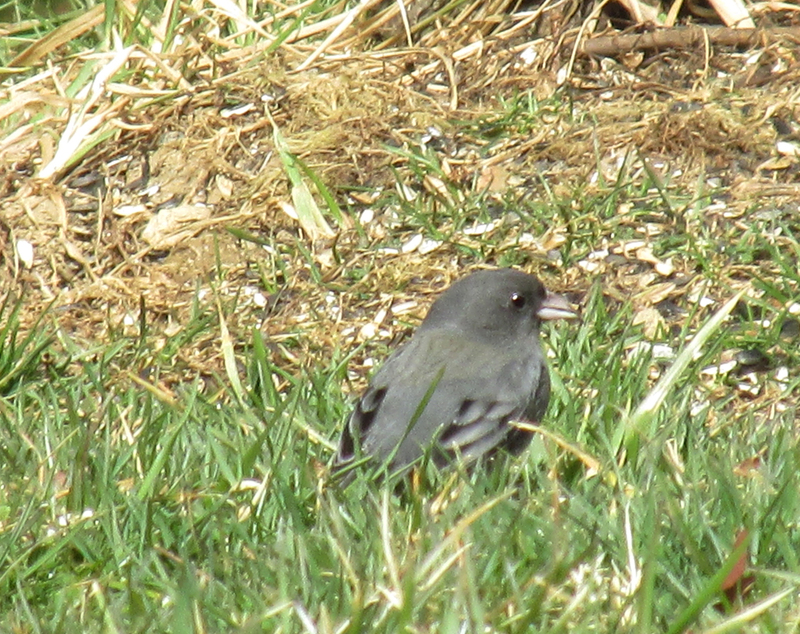 This Dark-eyed Junco was the first of its kind to return to my yard this fall. This individual arrived on Oct. 28. That first column I wrote back in 1995 focused on one of the region’s most prevalent winter residents — the Dark-eyed Junco. The first Dark-eyed Junco to put in an appearance in my yard this year did so on Oct. 28, just a few days ahead of the first winter storm. Here, with some revisions I have made through the years, is the very first “Feathered Friends” column. Of all the birds associated with winter weather, few are as symbolic as the Dark-eyed Junco, or “snow bird.” The junco occurs in several geographic variations. 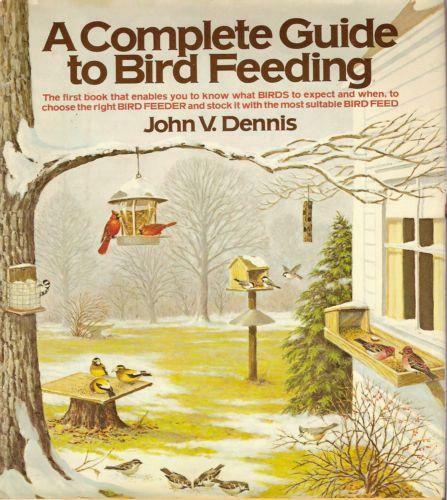 John V. Dennis, author of “A Complete Guide to Bird Feeding,” captures the essence of the junco in the following description: “Driving winds and swirling snow do not daunt this plucky bird. The coldest winter days see the junco as lively as ever and with a joie de vivre that bolsters our sagging spirits.” The Dark-eyed Junco’s scientific name, hyemalis, is New Latin for “wintry,” an apt description of this bird. Just as neotropical migrants make long distance journeys twice a year, the junco is also a migrating species. But in Appalachia, the junco is a special type of migrant. Most people think of birds as “going south for the winter.” In a basic sense this is true. But some juncos do not undertake a long horizontal (the scientific term) migration from north to south. Instead, these birds merely move from high elevations, such as the spruce fir peaks, to the lower elevations. This type of migration is known as vertical migration. Other juncos, such as those that spend their breeding season in northern locales, do make a southern migration and, at times, even mix with the vertical migrants. Photo by Bryan Stevens A Dark-eyed Junco on a fence at Carver’s Gap on Roan Mountain. 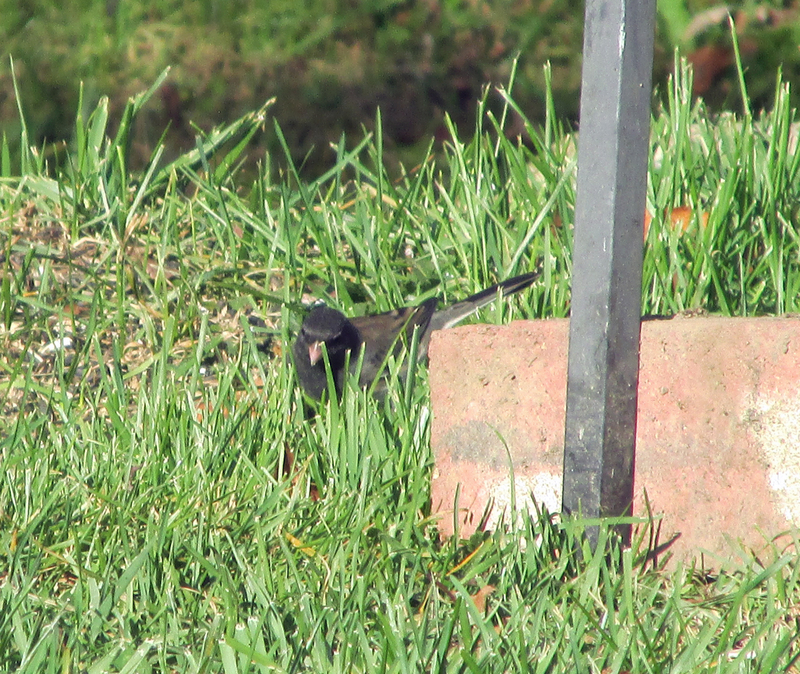 Juncos are usually in residence around my home by early November. Once they make themselves at home I can expect to play host to them until at least late April or early May of the following year. So, for at least six months, the snow bird is one of the most common and delightful feeder visitors a bird enthusiast could want. Juncos flock to feeders where they are rather mild-mannered — except among themselves. There are definite pecking orders in a junco flock, and females are usually on the lower tiers of the hierarchy. Females can sometimes be distinguished from males because of their paler gray or even brown upper plumage. Since juncos are primarily ground feeders they tend to shun hanging feeders. But one winter I observed a junco that had mastered perching on a hanging “pine cone” feeder to enjoy a suet and peanut butter mixture. 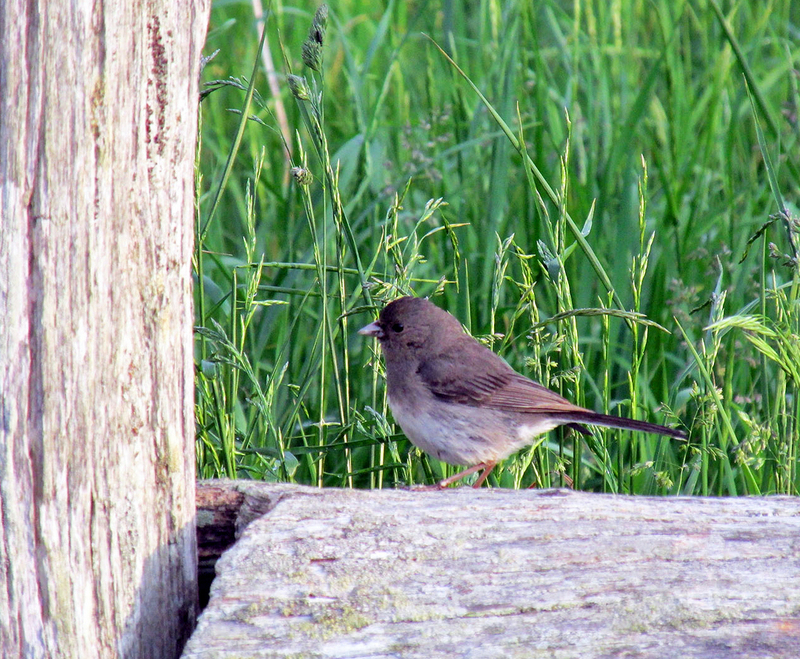 Still, most Dark-eyed Juncos often are content to glean the scraps other birds knock to the ground. Photo by Bryan Stevens A Dark-eyed Junco feeds on sunflower seeds in a hanging feeder. Juncos are widespread. They visit feeders across North America. 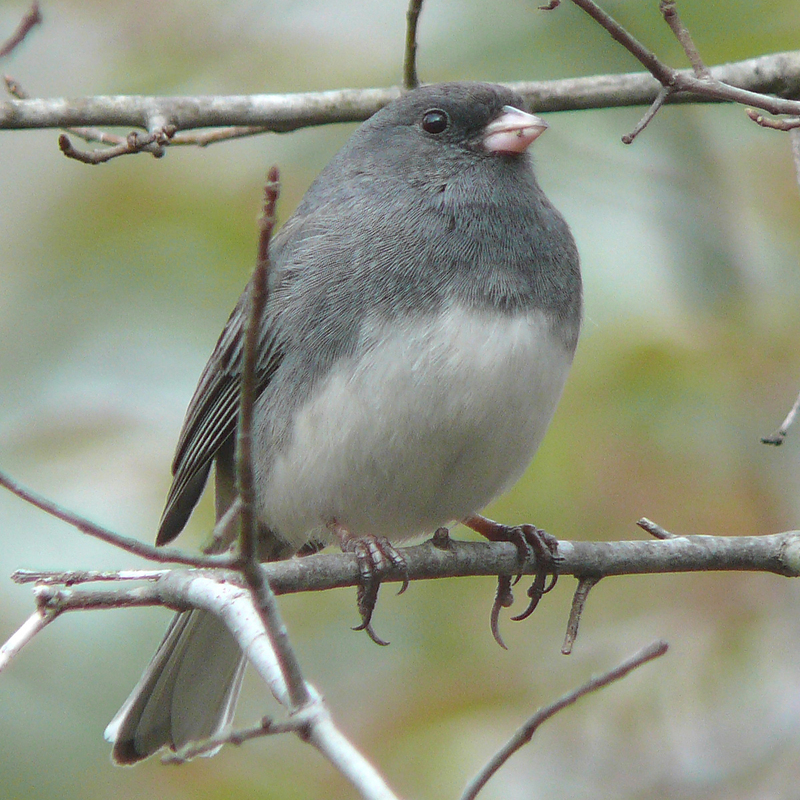 The junco is the most common species of bird to visit feeding stations. They will sample a variety of fare, but prefer such seeds as millet, cracked corn or black oil sunflower. There’s something about winter that makes a junco’s dark and light garb an appropriate and even striking choice, particularly against a backdrop of newly fallen snow. 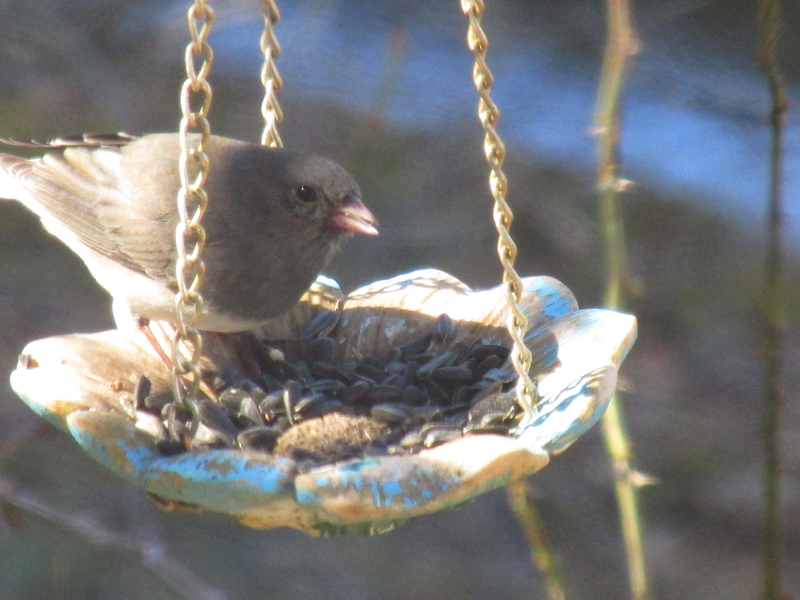 Of course, the real entertainment from juncos come from their frequent visits to our backyard feeders. When these birds flock to a feeder and begin a furious period of eating, I don’t even have to glance skyward or tune in the television weather forecast. I know what they know. Bad weather is on the way! Photo by Bryan Stevens A Dark-eyed Junco feeds on the ground beneath a feeder. This entry was posted in Birding, Birds and tagged Bristol Herald Courier, Carter County Compass, Elizabethton Star, Erwin Record, Marion County, McDowell News, North Carolina, Our Fine Feathered Friends on November 2, 2014 by Bryan Stevens. So thankful that you’re still writing, look forward to your column & face book posts, we love the birds and all wild life. Thanks, Donna. I appreciate it.